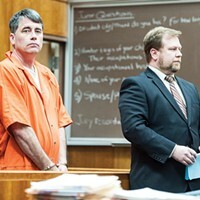 Gary Lee Bullock (above left) stands next to his attorney, Kaleb Cockrum, during his arraignment. 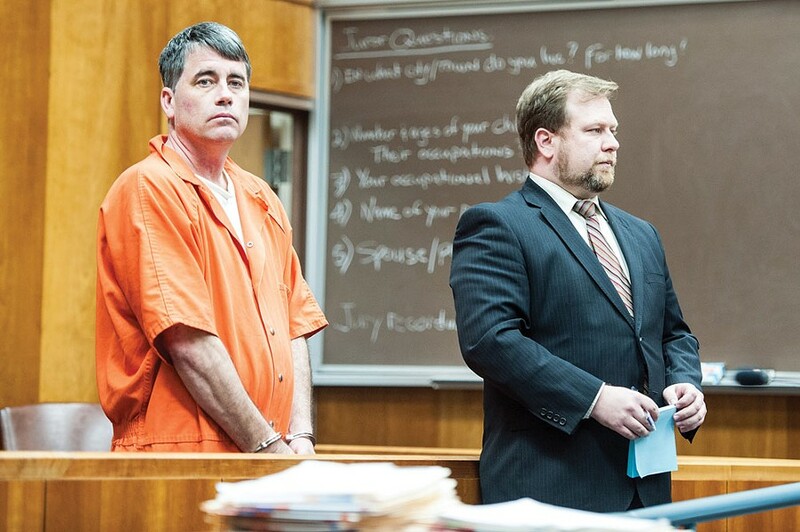 Multiple media outlets are reporting that, four days after being convicted of murdering and torturing St. Bernard’s Catholic Church pastor Eric Freed, Gary Lee Bullock has withdrawn his not guilty by reason of insanity plea, against the advice of his attorney. According to reports, with the sanity phase of his trial slated to begin this morning, Bullock surprised the courtroom by announcing his intent to withdraw his plea. Humboldt County Superior Court Judge John Feeney then advised Bullock of the rights he’d be giving up, made sure he understood them, and then set the case for sentencing on May 11, when Bullock will face life in prison without the possibility of parole. Journal attempts to contact Bullock's attorney, Kaleb Cockrum, have been unsuccessful, but we'll update this post if we hear back from him. Cockrum told the Lost Coast Outpost that Bullock came to the decision to withdraw his plea this morning, over Cockrum's objections. "I support him in this decision, [but] it was against my advice," Cockrum told the news site. After four days of deliberations, the jury came to the unanimous conclusion on Monday that Bullock was guilty of first degree murder, torture, residential burglary, carjacking and attempted arson stemming from the Jan. 1, 2014 slaying of Freed in the St. Bernard’s church rectory. The sanity phase, which had been slated to begin this morning, would have included testimony from three expert witnesses opining about whether Bullock was in a mental state at the time of the killing that both allowed him to know right from wrong and understand “the nature and quality of his act.” If the jury had deemed Bullock insane at the time of the crime, he would have been committed indefinitely to a state mental hospital for treatment, with the ultimate goal being rehabilitation and reintegration into society. See past Journal coverage of the Bullock trial here, and for more on insanity cases in general, see our March 31 cover story, “Sanity on Trial.” And, for more on today’s verdict or Bullock’s trial, see Ryan Burns’ coverage in the Lost Coast Outpost here.